In fact, the majority of people who join us on pilgrimage are not Buddhists but people looking to experience India in a different way, those with a keen interest to learn about both Tibetan and Indian culture with the ease of your trip being lead by two knowledgeable and personable guides. We are not your average package holiday, nor a religious trek, but a cultural tour somewhere in between. Buddhism is practiced by 99% of Tibetans and therefore plays a crucial part in their daily life. Tibetan Buddhism has a rich and fascinating history, both highly intellectual & mystical. The architecture is mind blowing, colourful and ornate. The food is healthy, simple and delicious. The people are unbelievably generous, have a great sense of humour and are rich in tradition. This world we live in has so much to teach us, our learning is never done. “Pilgrimage” is traditionally defined as “a journey to a place of particular interest or significance”. In modern literature, it is said to mean, “life viewed as a journey”. Through this pilgrimage, we hope to offer you new experiences. From these experiences, we have the opportunity to grow, live more compassionately, enjoy daily life and embrace its simplicities. Imagine having access to extraordinary Tibetan Buddhist masters, beautiful and sacred sites and hidden meditation caves where yogis years spend years at a time, all in the company of a highly accomplished Lama with excellent English, Karma Lhundup Rinpoche. Soon after his birth in the remote former Tibetan kingdom of Mustang, Karma’s mother opened a sealed earthen jar of traditional “birth beer” and a blazing fire came out of the jar. This was taken to mean that the child could be a reincarnation of a powerful Yogi. Led by Judy Arpana, a well-known spiritual consultant from Lismore and Karma Rinpoche, their annual October Pilgrimage to Northern India is an amazing opportunity to step into another world, discover fascinating aspects of Tibetan culture and medicine and deepen your spiritual understanding with a small group of like-minded people. 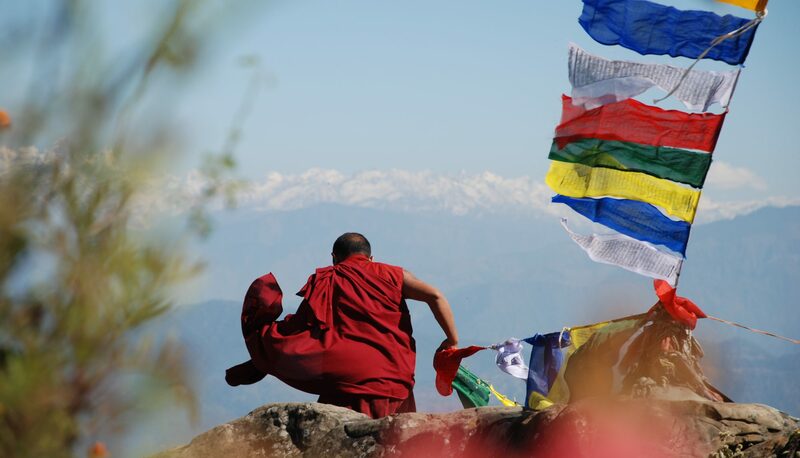 This 18-day trip begins in New Delhi, following five days in Dharamsala – the home of the Dalai Lama, a visit to the revered English-born nun, Jetsunma Tenzin Palmo’s nunnery near Bir, and three days at the sacred lake of Tso Pema. Karma and Judy have been leading pilgrimages in this area for 20 years and are deeply involved with the people and places in this part of India. While in Australia giving teachings, Karma Rinpoche explained that this tour was unique because of the access it offered to Tibetan Buddhist masters, both male and female. “Especially those who have done many years of retreat in the cave, and we get teachings from them (I do the translation) and we also arrange things like a lecture with the personal physician to His Holiness The Dalai Lama about traditional Tibetan healing. “It’s not just for Buddhists. Tibetan culture, how we live and our cuisine, it’s another approach to life, so at the end you end up having more options. It’s good to have options, isn’t it?,” he laughed. With a maximum of 12 members, personal attention is assured. “We travel like a family, for example in the beginning we shake hands and at the end at the airport we all hug,” Karma chuckled. He said a trip to India was a life-changing experience. “When you come to countries like India and Nepal you are very privileged and realise that you are living in some sort of a God realm in Australia. Until then, here no matter how much we have we always have complaints, some feeling of lack, although there is no lack in reality,” he smiled.